Our 2018 Convention keynote speaker is Congressman Joaquin Castro of Texas! Congressman Castro has spent his entire career making sure that all Americans have a fair shot at success and equal opportunity to build better lives for themselves and their families. Along with Congresswoman Pingree, he is an incredible champion for middle-class Americans in Congress, and we are excited to have him join us in Lewiston for our convention. 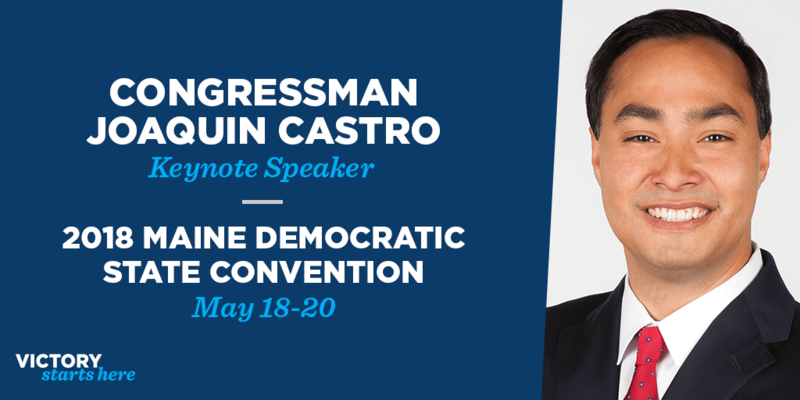 Like Congressman Castro, Maine Democrats are ready to demonstrate at Convention that we are the party that fights to make sure everyone has access to affordable health care, that everyone has the opportunity to earn a living wage, and that government works for Maine people — not against them. Congressman Castro is scheduled to speak at 4:00 p.m. on Saturday, May 19th. Interested in hearing Congressman Castro speak? Register for our 2018 Convention today!